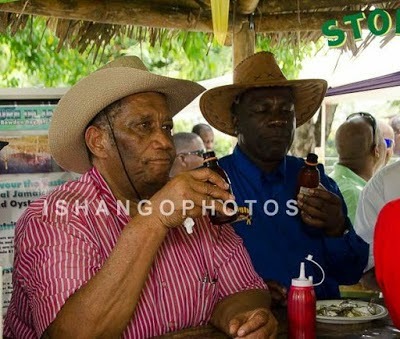 BEER VIBES: The minister (with Senator Norman Grant) at the 2013 Denbigh Agricultural Show in Clarendon. Below, with Simpson-Miller and others at Denbigh 2012. For those who knew him best, Roger Harold Clifford Clarke was a man who took a bonhomie approach to life and a commitedly civic sense of duty to his work in representational politics. He took both styles with him when he died on Thursday in Miami, Florida, where he'd gone to have surgery done on his back. He died of a massive heart attack while on his way home, the reports say. He was 74. A politician who produced laudable results, especially in his roles as MP and as the present government's Agriculture and Fisheries minister, Clarke earned the respect of his constituents in North East St. Elizabeth (which he represented from 1991 to 2007) and Central Westmoreland (up until the time of his death) - and his numerous colleagues in Gordon House, not least among them PM Portia Simpson-Miller. In responding to the shocking news of Clarke's death, Simpson-Miller saluted the late PNP stalwart for his conviction on the job and the compassion he brought to everyday life. "Roger Clarke was a special kind of politician who was loved not only by members of his party but people on the other side," Simpson-Miller noted in a statement released by the OPM. "He was loved by Jamaicans of all walks of life. His caring, gentle and compassionate spirit was matched by his generosity, good humour and laughter. It's hard for us to be sad when Roger Clarke was a man who brought laughter to so many of us." Personally, what struck me most about this heftily built son of Westmoreland (born June 11, 1940) was his jovial, easy-to-get-along-with aura, typical of down-to-earth folks who can walk with kings without losing that common touch. It's an immensely likeable quality that the Opposition Leader also recognized in him. "[Clarke] had a cheerful nature and sharp wit, always injecting fun and revelry in his commentary and to debates in the House," Andrew Holness recalled. "He was a diffuser; there was always a simple thought he would introduce to a tense discussion that would cause us to look at ourselves and change the mood of the discussion." In his time, Roger Clarke led quite a successful political career, to say the least. He never lost an election, winning a total of eight (two Local Government polls and six General Elections). His resume further highlights such positions as former Mayor of Black River and Chair of the St. Elizabeth Parish Council. For three years (1988-1991) he occupied the presidency of the Local Government Authority. But the role to which he brought the most distinguished service and obvious devotion was that of agriculture minister. 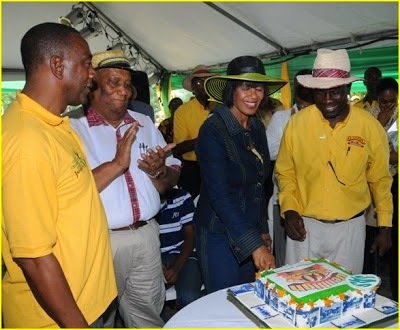 "He was a champion of the agricultural sector who contributed significantly to its development, both as minister and as a farmer," proclaimed Clarke's JLP counterpart J.C. Hutchinson. "I will miss his wise counsel," Simpson-Miller added, "his tremendous sense of duty to public life and his outstanding contribution to agriculture."